This species is not very common on campus, it is more common to the west particularly towards Charters Towers. 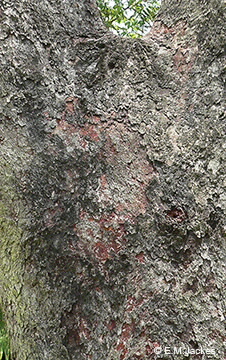 However, it can be distinguished by the bark which is tessellated or scaly and when the scales fall off irregularly the bark below is a different shade and hence results in a mottled appearance. This new bark is a rusty-red to brown in colour. The fruit is urn-shaped about 1.5 cm long; flowers white in large clusters on the outside.